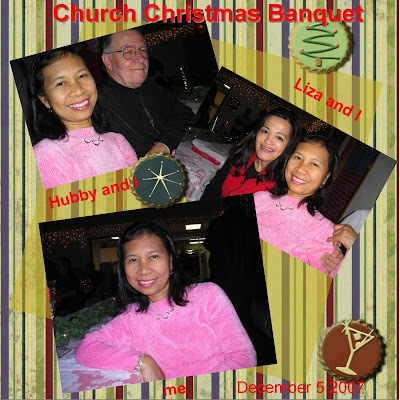 We had a good Christmas banquet in our church tonight. Lots and lots of foods were brought in by the church members. There were ham, turkey, green bean casserole, stuffing, mashed potatoes, and a lot more that I can't remeber. Of course there were lots of desserts, different kinds of cakes, cookies, pies, etc. I brought lumpia and as expected they were all gone not too long. The dining hall was well decorated with garlands, Christmas lights, Christmas ornaments and Christmas trees. After eating, Bro. Hugh had preached a good message. We had such a good time tonight in the church. By the way, our Pastor and his wife arrived yesterday from a week vacation. It's good they're back safely and we missed them.